Sending your college student a care package is a great way to support their endeavors. Whether you decide to supply essentials like toiletries or fun stuff like snacks, what you send will be greatly appreciated by your student. Putting together an incredibly creative care package for the student you love allows you to customize the package with favorite brands or specific things your student asked for. Need some ideas? These ideas are sure to make the student in your life the envy of his dorm. Use other warm clothing items like socks, a scarf or hat to add filler to the box. Frame a piece of scrapbooking paper and attach a dry erase marker. This makes a cute dry erase board for friends to leave messages. A small magnetic chalkboard for hanging on the door - roommates can leave notes for each other, or friends can leave notes to let them know they stopped by. Inflatable furniture can make a room more fun, and offer people places to sit in lieu of sitting on the bed. If your student is celebrating his birthday while he's away, make him feel loved with a fun, birthday-in-a-box care package. Make sure to include enough for his roommates so that he can have a little party! Fan items purchased from the school store like foam fingers, pom-poms or sports pennants, etc. If you want to send a care package but you don't have time to put it altogether, try a company that caters to this need. These companies take the guess work out of packing for you, promising your student gets a great package every time. CampusCube offers a variety of care packages for students including those designed for girls and guys. Care packages also cover a variety of situations. For example, they have a package filled with useful items to help your student through final exams. You can also choose packages designed for birthdays and holidays. Your options include purchasing an individual care package or subscribing to a pre-paid plan of up to eight care packages. (No monthly billing.) If you choose the pre-paid plan, you can even choose the months your child gets a care package so that it fits your student's school year. CampusCube uses only the best, healthy, gourmet ingredients and they ship via USPS Priority mail and offer a low, flat rate shipping charge. At Hip Kits you can find packages that are especially designed with the college student in mind. All the boxes include food items, a 'bit of inspiration' and something fun. Options range from organic choices, to junk food, to everything in between. Shop by themes like exams, thinking of you, or holidays. Hip Kits also has a Kit-of-the-Month club where your student gets something delivered each month. What is especially nice about Hip Kits is that you can customize the pre-made options with various 'add-ons,' making it really easy to create a personalized care package. Kits range in price from $20 to $50, so they will not break your bank. Carepackages.com allows you to shop for several themed baskets via a variety of categories such as 'exams,' or 'holidays.' They offer ready-made packages ranging in prices from $20 to $100. All care packages include snack food and there is a wide range of options. Customers can choose from a tin of cookies, to a full package including candy, chips and other fun items that vary with the theme. They also offer various care package plans. The plans range in price from $90 for three care packages for the fall, to $161 for six care packages sent throughout the year. You can also send personalized messages to your student in your package. If you have a student who doesn't take himself too seriously, Mirth-in-a-Box might be just the place for you. Mirthinabox.com sends packages full of fun novelty items. Examples include things like Shakespearean insult mugs, disguise glasses or Frisbees. You can shop by occasion such as a holiday, by reason (such as sending a get well soon package), by the type of package you want to send, or you can peruse their college section which features boxes full of fun novelty items and snacks. You can also build your package from the ground up, which is a neat feature for a care package company. Because of the huge variety, prices can range from $30 to about $90, so you're sure to find something to fit your budget. 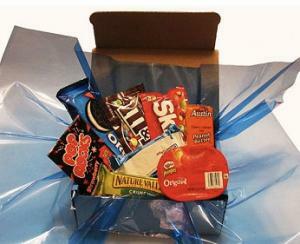 Care packages from From-mom.com focus on food items like cookies, candy, soup and snacks. You have multitudes of options including themed packages for things like finals, packages that contain just cookies, a 'Club Mom' option that lets you pre-order care packages for the whole year, and a customizable option so you can build your own care package. Prices vary greatly, with a box of cookies for just under $25 to a more developed theme package for over $100. You can also order a pre-made package and add individual items, adding to the total cost of the box. Gift Boxes by Mail specializes in customized gift boxes for $20 or less. 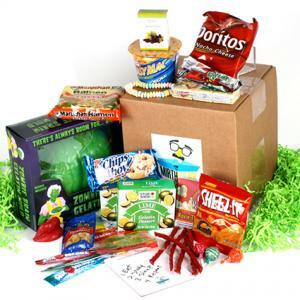 You build the box with a wide selection of novelty and snack items. While the company doesn't do large gift boxes or baskets, they do make nice boxes full of sweets or snacks (or anything else you want to put in there) that are perfect-sized for fitting into a shoebox. While Amazon Prime Pantry is not specifically geared toward sending care packages to your college student, it is worth considering, especially if you have a student who is in an apartment. Items available include snacks, cleaning supplies, and even toiletries. For a flat shipping rate, you get to fill a box and they will deliver it. You can also shop from past lists, which makes it convenient to remember what you have sent. Whether you are supporting your student by sending needed items like toiletries, or you just want to send a little something that says, 'I Love You,' it's hard to go wrong with a care package. Create your own or buy a prepackaged box from a company, or alternate between the two the keep your student guessing.